Please note: the 2018 Jet Boating Season has ended so we are not taking any more bookings for 2018. To book please call us on +44 (0)1348 837764. We do our best to match passengers to like-minded passengers and appropriate sea conditions so we offer Family trips suitable for everyone and Adult trips for adults and older children. We will be happy to discuss which trip would be most suitable given your interests and the prevailing forecast. This is a unique experience. Places are limited so early booking is advisable to ensure the trip and time of your choice. For the latest information on weather and sailings please see our Facebook page or follow us on Twitter. Please read our (very reasonable) terms and conditions before booking; by booking you are deemed to accept them. Please see our FAQs page for answers to popular questions (eg age and weight limits, weather, clothing, medical conditions, family and dog friendly trips) or feel free to call or email us. Boat Trip Departure Points and Map: St Justinian and Whitesands beach, St Davids, Pembrokeshire. 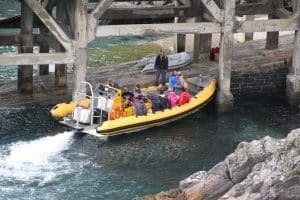 Our Ramsey Island wildlife boat trips run from St Justinian (all season) and Whitesands beach (summer), St Davids. Most trips depart from St Justinian (SA62 6PY or OS grid ref: SM724252) but we can do beach trips from Whitesands beach (SA62 6PS or OS grid ref: SM733272) in the school summer holidays. We can operate from Whitesands (or other locations) at any time by prior arrangement subject to sea and weather conditions. 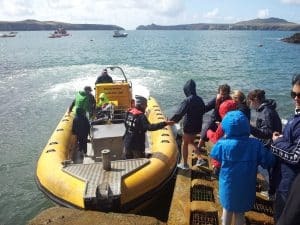 You can download a Guide to St Davids Boat Trip Departure Points (St Justinian and Whitesands) from the bottom of this page. Link to detailed map of St Davids, St Justinian and Whitesands. You can move the map around your screen to focus on the area you want and can zoom in for more detail. Pembrokeshire Wildlife Boat Trips from St Justinian, the lifeboat station, St Davids. The boat will be brought alongside a slipway; you do not need to wade out to the boat. Please note: there are over 50 concrete steps (with a handrail) to walk down to the slip at St Justinian. Please see our St Justinian photo gallery for detailed images of the steps, slipways and the lifeboat station. If you have any difficulty walking please let us know so that we can discuss whether or not St Justinian is an option for you. Parking at St Justinian itself is very limited. If there is no space in the lay-bys at the end of the road (common at busy times) there is a pay and display parking field about 10 minutes' walk from the harbour. 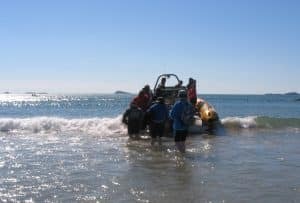 At Whitesands beach we bring the boat into shallow water (approximately knee depth); you will need to wade out to board. We are the only boat company to operate beach trips from Whitesands. Car park, toilet and shop facilities are next to the beach, which is part of the Pembrokeshire coast path. If you have difficulty walking there are all terrain wheelchairs at Whitesands which can go across the beach and into shallow water. We will do everything we can to assist you to board but we are unable to physically lift passengers. If you have significant mobility issues Whitesands is the most accessible boarding point but we need to plan carefully. Please call us so that we can discuss the best tidal and weather conditions to suit your needs. The Celtic Coaster bus (no.403) runs to both Whitesands and St Justinian from St Davids from Easter to September and can accommodate 2 wheelchairs. Passengers are asked to be at the departure point ready to sign in at least 15 minutes before their trip in low season and 30 minutes before in high season (summer school holidays). Do please allow yourselves lots of time to get to the departure point and park; holiday periods can be really busy. We regret that we cannot take responsibility for passengers being late: out of respect for other passengers we cannot wait longer than 15 minutes.